We hope you've enjoyed the first two tutorials from our May Blog Hop. 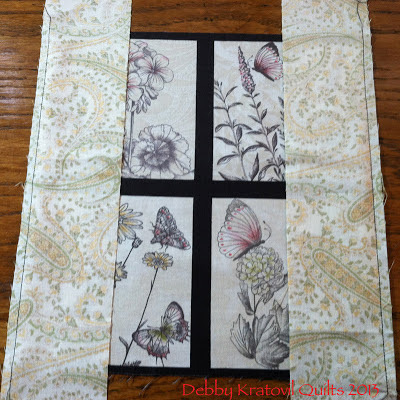 Today we have Debby Kratovil sharing her Magical Mitering technique using the Savannah collection. If you've ever feared making a mitered corner, you'll love this! 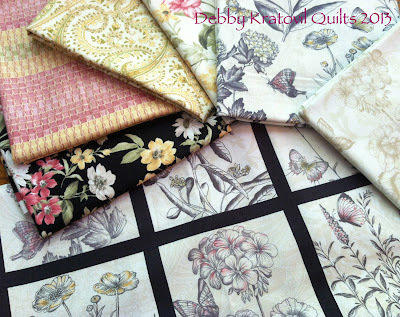 After you read through Debby's tutorial, head over to her blog for an inspiring virtual gallery of quilts, techniques (including an entire section on using 60 degree angles!) and more--she's incredibly prolific and well-known throughout the industry! 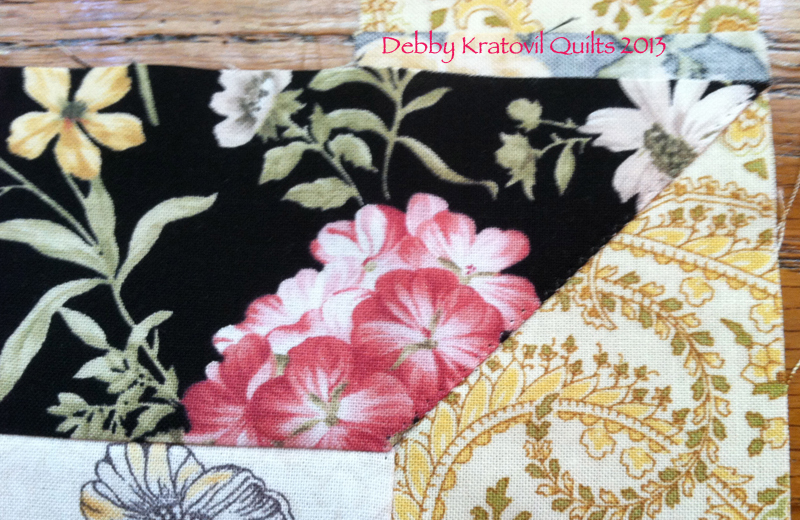 Also, Debby is hosting a giveaway for a fat quarter bundle of Savannah--don't miss out on the chance to enter! 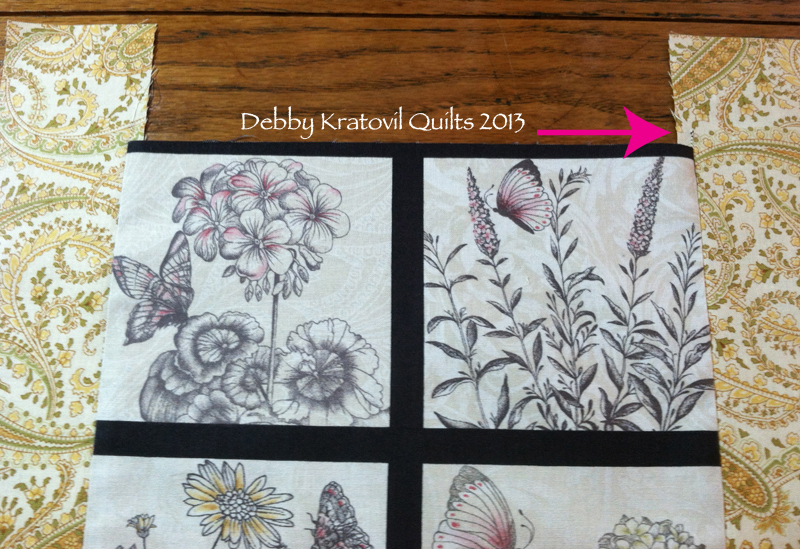 Hi, I'm Debby over from Debby Kratovil Quilts! 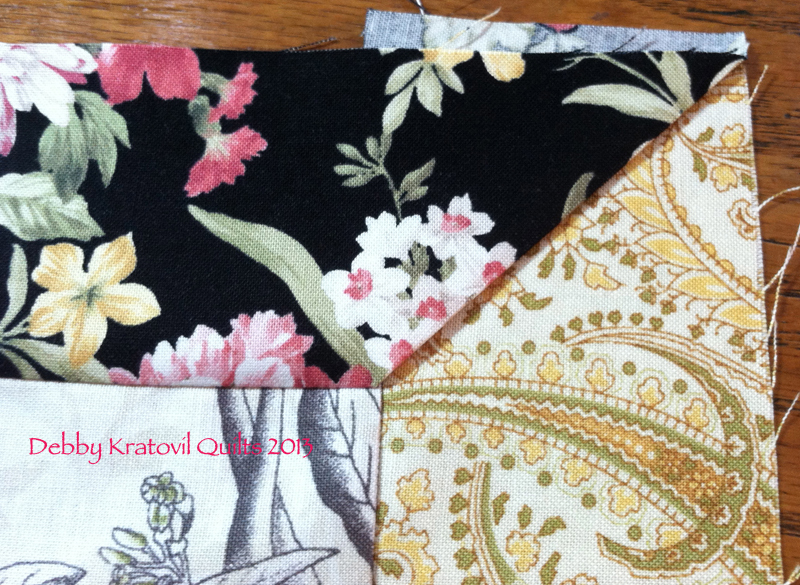 I like to say: All quilts. Only quilts. All the time. 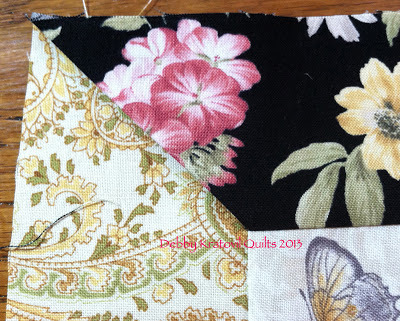 My 14 years as Special Projects Editor for a quilting magazine required me to come up with all sorts of tips and tricks and techniques which I love to share. I chose the Savannah Collection to showcase my much-requested Magical Mitering technique because of the small panels of flowers that resemble windows. I enjoy showing quilters easy ways to approach otherwise difficult quilting challenges. 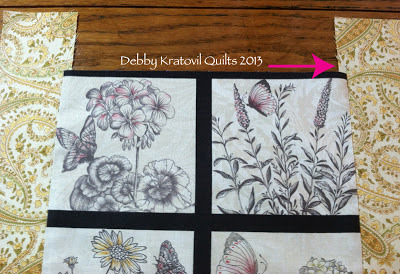 I try to include tutorials often at my blog along with many of the pictures of quilts I've had published over the years. 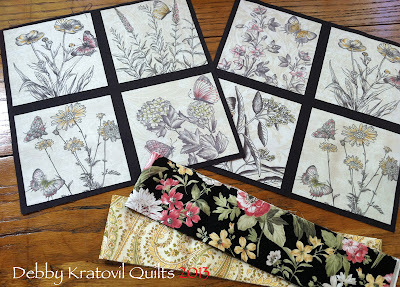 Each set of 4 panels measures 9-1/2". I commend Benartex on making sure that the black sections between each panel measures 1/2" so that I didn't have to destroy one panel to cut out another. I was able to get the required 1/4" around the outside. I cut the two contrasting strips (yellow and black prints) at 2-1/2" x wof. Because I am mitering, the strips have to be longer that the 9-1/2" sides by at least 2-1/2" twice. So, I cut them at 9-1/2" + 2-1/2" + 2-1/2" , which equals 14-1/2". You can throw in an extra inch for safety. So, what does this look like? Center the first two strips (yellow) and sew with 1/4" seam to panel center. Note that my stitching goes BEYOND the end. We do NOT begin and end 1/4" away as in traditional mitering. This is important, as you will see in the next photos. I used black thread for demonstration only, so you can see the seam. 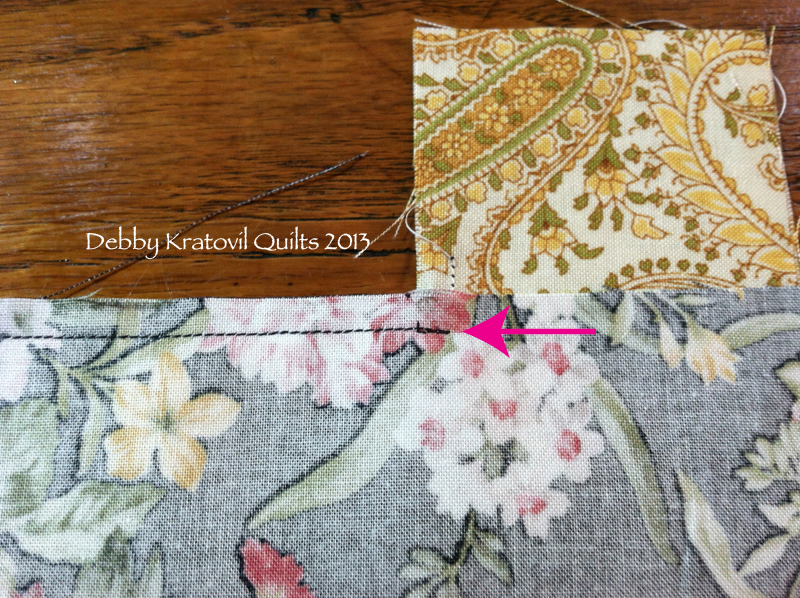 This stitching will be your visual guide when placing the next set of strips. Now it's time to add the next set of strips. 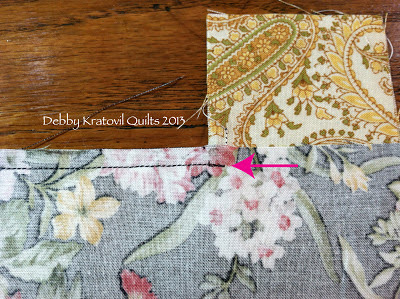 Using the extended stitching as your guide to place your sewing machine needle EXACTLY, begin sewing at the stitching and end at the stitching on the other side. How do we press the seams of this second set of strips? AWAY from the center. Then we fold the black strips at a 45 degree angle as shown, which amazingly resembles a miter. WAIT! IT IS A MITER! 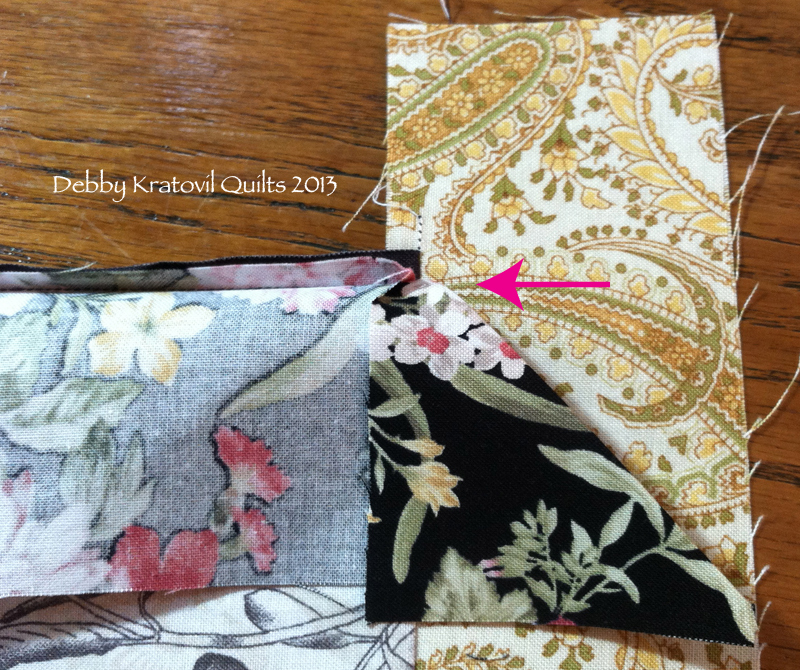 Fold back, pin and get ready to stitch. Yes, this is stitched with a tiny zig zag and monofilament thread. Wait? Can I see the back? Look closely; you can see the stitching. 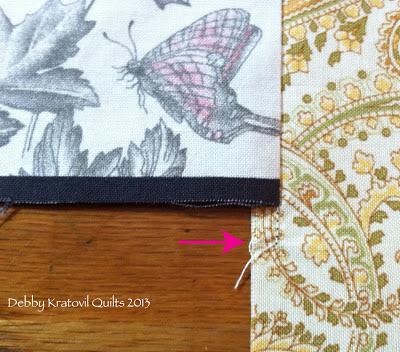 Trim away the excess folded under fabrics. Magically mitered strips. You can call this Attic Windows, also. Remember: First two strips get pressed TOWARD the center. The last two strips are pressed AWAY from the center. I made 4 of these panels. Two of the blocks have yellow on the side and two have yellow on the top and bottom. This way the same colors don't touch. Well, what does it look like? 13" blocks and YES! I mitered the borders, too! For some reason I get carried away when I start sewing. I almost never make something small. 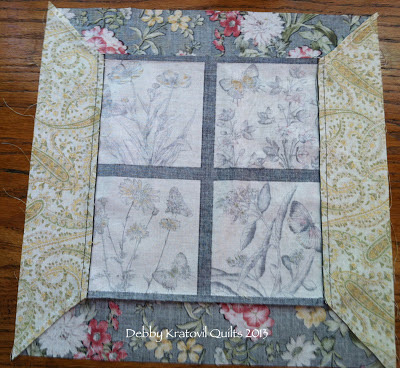 Don't these Savannah panels look like window panes viewing a lovely English garden? Don't forget to head over to her blog to enter the giveaway! And stop back here tomorrow for the last day of this month's hop! Thank you, Debby! Great tutorial! That looks easy enough for me to do! Thanks for the tutorial! You take the mystery out of the magic - thanks! Definitely bookmarking this for future reference. Thanks for this tutorial. I will definitely give it a try! Thanks Debby! I've always admired mitred corners but never tried them!! What a clever concept. Thanks for the tutorial. I definitely will give mitered corners another try with this technique. I really like the finish a mitered corner presents. ooh that seeams easy enough! thanks Debby! Great tutorial! I'm bookmarking the instructions! Yes, they absolutely look like window panes. You make this look so easy to do. Your tutorial is so helpful any one of us can make this for ourselves. Thank you for making this possible. Thanks for the tutorial. It will make doing miters so much easier. I hope it's as easy as it looks! I'm going to try it! I looks very easy and is an interesting method. Great tip! 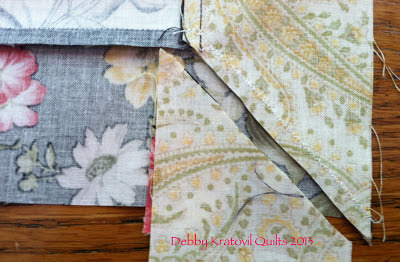 What an easy way to make mitered corners with different fabrics. Great tutorial! I love the project, also! Too cute! Great tutorial. I love tutes with lots of photos. Great tut... and I love the fabric. Thanks for the great tutorial!!! Takes the fear factor out of mitering!! WOW! This is so cool! And it looks so easy. I think that I will be doing more of these now. Thanks for the tutorial. Great tutorial! I sometimes make the strips to be mitered even longer than necessary when there's a pattern to match, like the stripes in that last photo. 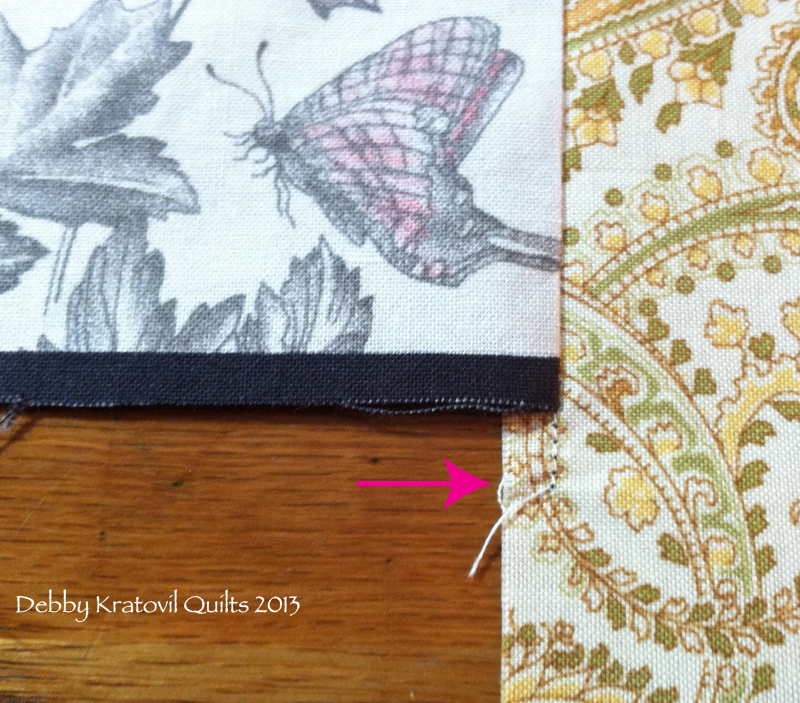 That way, I can move the fabric around until the miter looks like I want it to. Works well with large florals too. I love this tutorial. I think this would make some pretty nice i-spy type blocks for my kids. Lots of possibilities!! Wow what a wonderful tutorial. I loved it and will be saving it for a future project. Thanks for sharing! That's is a beautiful quilt; a great wallhanging. The tutorial pictures are perfectly clear. Thanks. Perfect timing...the quilt I am working on will have mitered borders and there aren't instructions included in the pattern! Great tutorial. Thanks. I'm going to try that. That is so pretty!! So simple but so elegant..Thank you for the tutorial..
Debby you always make things easier for us, thank you! 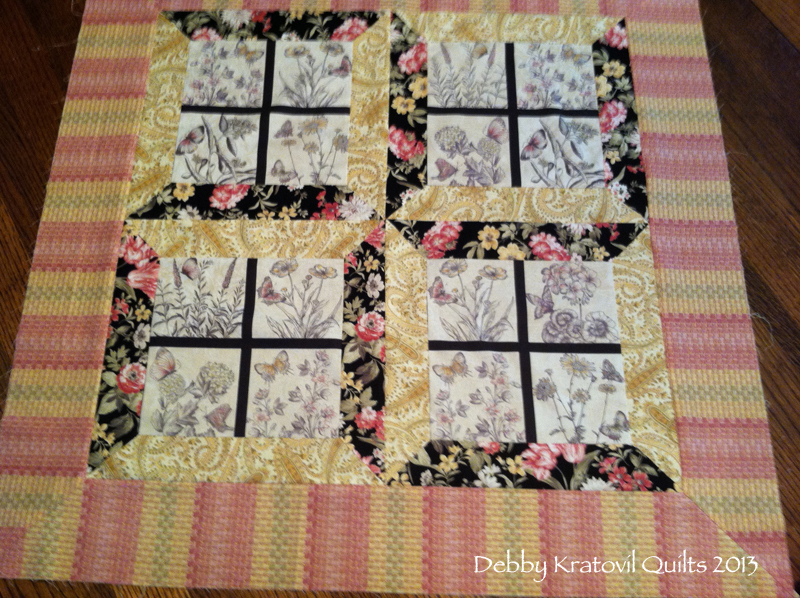 Beautiful quiltlet, love the fabric! Great tutorial. I can see perfect miters every time! Love that fabric! Great technique! I will have to give it a try, I really like the end result. Great tutorial! Will have to give it a try. What a great tutorial! I am bookimarking this one! gasp! an easy peasy way to miter those corners! much prefer the look of mitered corners ... now, no more troubles getting a great corner! thanx for the tute! 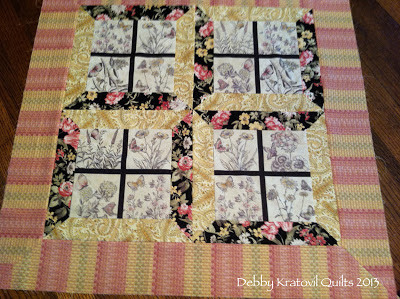 Love Debbie's blog and tutorials. Great tutorial! I've never made a mitered border, but your tutorial inspired me to try one! I can't believe this method. When I started reading I thought no way can I do that but by the end I knew I could. thank you. Thanks for the great tutorial! I am going to have to try this out sometime soon! Great tutorial....I will definitely try this one! Thank you! Thank you for this tutorial. Now I think I can tackle mitered corners! This tutorial has given me the courage to try mitered corners and borders! 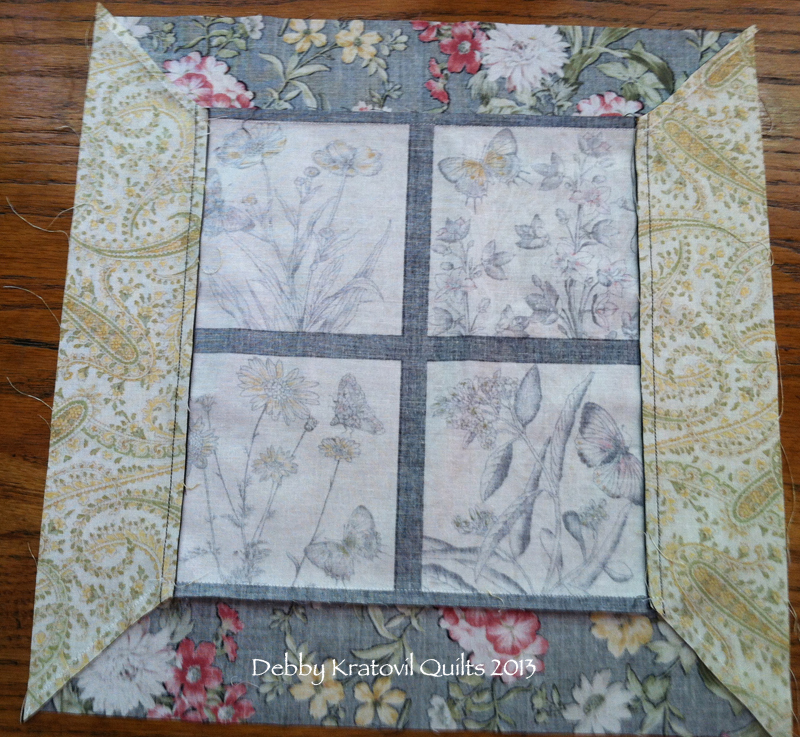 I love the fabric that was used! I love seeing flowers when I look out my window! I think I'll finally give mitered corners a try - you make it look so easy! Terrific tutorial! I'll be trying it soon. Great instructions. I love the botanical prints in the Savannah collection. Wow! I am going to have to try this. Great idea! Great tutorial, all the photos make it very easy to follow! Fantastic tutorial, I shy away from mitered corners normally, not any more.Oh and the fabric is gorgeous. Love the fabrics! This is an interesting way of doing miters! I like this tutorial. It makes Miters seem so easy. Also love the quilt design. Thanks for the tutorial! The fabric is lovely. Love this tutorial. Thanks for the chance to win!